How Do Asian Stock Markets React to US-Led Strikes in Syria? Asian markets were the first to react to American-led strikes on Syria carried out on late Friday evening (13/04). The strikes were an answer to a chemical attack in Douma on April 7, allegedly conducted by the Syrian government under the leadership of President Bashar Assad. The US strike on Syria - supported by France and the United Kingdom - caused US-Russian relations to hit a new low. However, the strike did not lead to direct military confrontations between the USA and Russia and therefore markets are somewhat relieved on Monday. In total 105 missiles were launched at targets the Pentagon described as chemical weapons facilities in Syria. On Saturday (14/04), US President Donald Trump tweeted "mission accomplished", implying there is a likely probability that there will not come another strike soon. Meanwhile, Russian President Vladimir Putin warned on Sunday (15/04) that further Western attacks on Syria would bring chaos to world affairs. These statements are all signs that direct confrontations between the USA and Russia seem unlikely. Stocks across Asia inched up cautiously in early Monday morning trading (16/04), seemingly awaiting clear direction from European and US stock markets that will open later today. There is some mild risk appetite, evidenced by slightly weakening safe haven assets. For example, Japan's yen recovered from morning lows after polls showed sliding support for the administration of Japanese Prime Minister Shinzo Abe. His government has been favoring a weaker currency in order to boost the nation's exports performance. One day before the American-led strike on Syria, the Trump administration announced new sanctions on Russia in an effort to punish Moscow for its attempts to interfere in the 2016 US presidential election. As a result of the sanctions the value of companies owned by Russian oligarchs plummeted. Moreover, US President Donald Trump announced more economic sanctions on Russia will follow. Update - 09:00 am local Jakarta time: stocks in mainland China and Hong Kong, however, opened in red territory on Monday morning and are somewhat dragging the whole Asian market down. 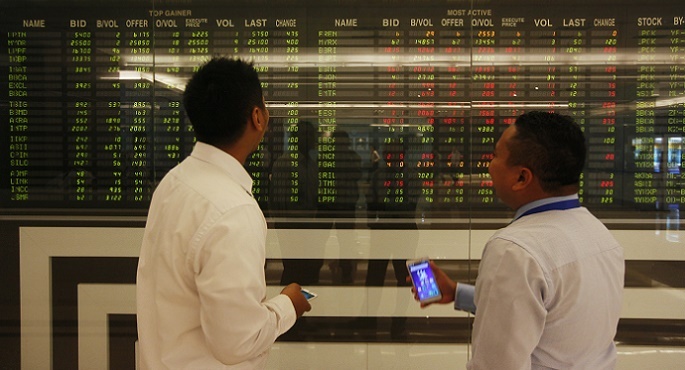 Indonesia's benchmark Jakarta Composite Index inched up slightly. By 09:05 am the index was up 0.19 percent. The rupiah, however, had depreciated 0.11 percent to IDR 13,770 per US dollar by the same time.